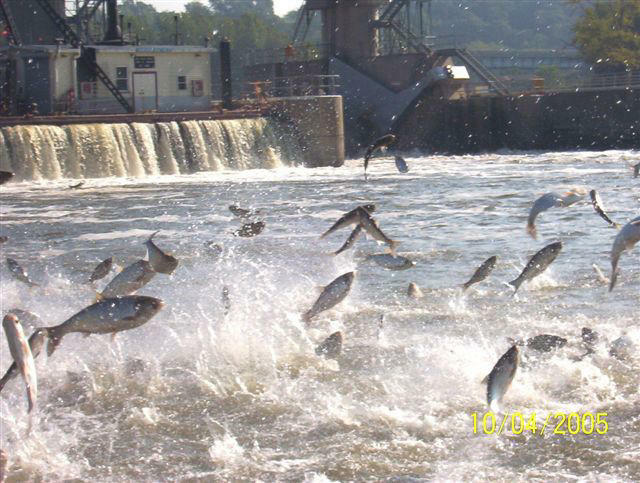 Record rainfall in the Chicago area has heightened concerns that invasive Asian carp will escape electronic and physical barriers along the Des Plaines River, and make their way into the Great Lakes. If Asian carp were to get into the Great Lakes, it's feared they could seriously impact the fishing and recreation industries. However, U.S. Army Corps of Engineers spokeswoman Felicia Kirksey says crews stationed along the 13-mile barrier have seen no evidence of the fish breaching the structure. "At this point we've got crews out inspecting, checking to see if there's any water going over the trail. We see water, but we don't see any fish crossing over, so that's a good thing," Kirksey says. "There's a significant amount of rain that would need to fall for the river to overflow its banks by that much to make those barriers ineffective." More rain is expected in the Chicago area today and tomorrow. Meanwhile, the city of Chicago has reversed the flow of the Chicago River to keep it from flowing into nearby rivers.